New business owners that haven’t had to fiddle with payroll taxes before will frequently ask me “What are Payroll Taxes and how much will my payroll taxes be”? This is a reasonable question and I will try to lay it out here. Payroll taxes are the Federal, State, and sometimes local taxes that are owed when wages are paid to an employee. There are two parts: the company portion that the employer owes and pays, and the employee portion which the employer withholds and pays on behalf of the employee. 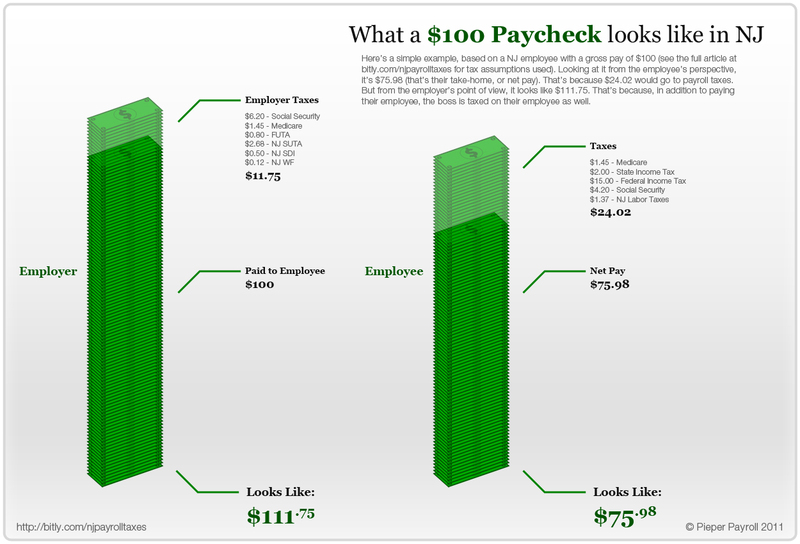 How much are Payroll Taxes? Our example above is based on a New Jersey employee with a gross pay of $100.00 and based on the tax assumptions described below. From the employee’s perspective their take-home (net) pay would be $75.98 meaning that $24.02 would be their share of the payroll taxes. These are employee taxes. As an employer it is your responsibility to withhold these taxes based on the current tax schedule and how the employee has completed their W4 form. The W4 form is the form that tells the employer the filing status and exemptions that help to define the tax rate that should be applied to the employee’s wages. When you hire a payroll service these taxes will be calculated automatically using sophisticated software. The software will annualize the pay for any given pay period in order to select the proper tax rate. If an employee desires, they can instruct the employer to withhold at other than standard rates. They use the W4 form do to this. In the attached example we assumed a federal tax rate of 15% federal and a New Jersey tax rate of 2%. There are both employee and employer components to these taxes. These taxes are levied on the first $128,700 in wages (in 2018). Generally, the wage base is indexed with inflation and can change from year to year. In years past the tax rate was the same for both employers and employees at 6.2%. As with Social Security taxes there are both employee and employer components. These taxes do not have a maximum wage base. The tax rate is 1.45% of wages for both employers and employees. The wage threshold for Medicare is the same as for Social Security. There is an additional Medicare Tax applies to an individual’s Medicare wages that exceed a threshold amount based on the taxpayer’s filing status. Employers are responsible for withholding the 0.9% Additional Medicare Tax on an individual’s wages paid in excess of $200,000 (in 2018) without regard to the employee’s filing status. There’s no employer match for Additional Medicare Tax. This is an employer tax only. The FUTA rate is 6.0 %, but New Jersey businesses can take a credit of up to 5.4% for SUTA taxes that you pay (this is a state level calculation). If you are eligible for the maximum credit (and New Jersey businesses are) your effective FUTA rate will be 0.6%. Based on a wage base for FUTA of $7,000 this amounts to $42/year. You will stop paying FUTA for each employee once his or her wages exceed $7,000 for the year. Generally, your SUTA tax rate is based on the amount of unemployment claims that are filed by employees that you have terminated. Your tax rate will depend on the state’s experience with your business. While this is usually just an employer tax some states also have an employee component. New Jersey is one of these states. If your business is new, your SUTA tax rate starts at a new business rate defined by the state and rises or falls based on the number of claims. In New Jersey new businesses currently start at a rate of 2.6825%. If, over time, your business has a lot of unemployment claims made against it your rate will go higher. If not, your rate will go lower. In New Jersey I have seen employer unemployment tax rates be as high as 5.8% and as low as 0.5825% (rates that low are rare). As mentioned earlier, New Jersey has an employee unemployment tax as well as an employer unemployment tax. That rate doesn’t vary based on experience and is currently 0.3825%. New Jersey has a somewhat complicated administration of the unemployment tax. The employer specific experience rate is revised mid-year, rather than a calendar year, and is effective from July 1st through June 30th of the next year. To make things more complicated New Jersey never calculates the experience rates until after June 30th. This means that New Jersey business owners aren’t told their new experience rate until late July or early August even though they should be administering their payrolls at the new rate effective July 1st. Payroll companies know how to take this in stride and will true up the tax liability for any payrolls run after July 1st but before the new rates are issued. In order for this to work well the business owner has to inform the payroll service of any changes in their rates as soon as they are notified by the state. As with FUTA and FICA (Social Security and Medicare) taxes, SUTA tax rates are only applied to earnings below a certain wage threshold. In New Jersey the taxable wage base is established from calendar year to calendar year (January 1st through December 31st) and updated annually. In New Jersey the wage base (2018) is $33700. In our example we used the new business rate of 2.6825% for the employer and 0.3825% for the employee. Most states do not have a disability tax, but New Jersey has both an employer and employee tax. As with New Jersey Unemployment taxes, the employer tax is experience based and the employee tax is fixed. The taxable wage base is the same as with Unemployment. In 2018 we used the new business rate of 0.5% for the employer tax. The employee tax rate is 0.19%. Most states do not have a Work Force tax (some- times called a job training tax), but as with the Disability and Unemployment taxes, New Jersey has both an employer and employee tax. The Work Force Development Tax is not experience based and is not changed very often. The taxable wage base is the same as with Unemployment and Disability. In our example we used the standard rate of 0.1175% for the employer tax and 0.0425% for the employee tax rate. This New Jersey employee based tax is a relatively new tax but in its few years of existence the tax rate has changed every year. The wage base is the same as with Unemployment, Disability, and Work Force Development. The 2018 tax rate is 0.9%. Another relatively rare tax, this is not levied in New Jersey. Massachusetts is an example of a state that levies this employee based tax. Our example does not include this tax. Worker Compensation Insurance is required in every state but most states allow the tax to be administered by private insurers. There are a handful of states that do not allow private insurers to handle this tax and administer it directly e.g. Washington. They require the tax to be submitted w/ your other payroll taxes. Our example does not include this tax. For information on Federal payroll tax requirements, check out IRS publication 15, Circular E. For information on State payroll tax requirements, contact your state’s revenue and labor departments.